"Now, I have a black son in Baltimore," the white police detective remembered thinking as he cradled his baby boy. Rachel L. Swarns, "'I Have a Black Son in Baltimore': Anxious New Parents and an Era of Unease," The New York Times, August 23, 2016. http://www.nytimes.com/2016/08/24/us/i-have-a-black-son-in-baltimore-anxious-new-parents-and-an-era-of-unease.html. A particular excerpt of the DW documentary “Afro.Germany” went viral: the touching testimony of one of the oldest Afro-Germans born in Berlin. Here’s what can be learned from social media users’ hundreds of reactions. “I am an African – I didn’t even know Cameroon and Togo were German colonies,” said one social media user, reacting to an online video clip about the life and times of Theodor Wonja Michael, one of Germany’s oldest contemporary witnesses. The clip is an excerpt from “Afro.Germany,” a documentary project by Deutsche Welle, which aims to chronicle the diversity of Black experiences in Germany and challenge the historical amnesia surrounding Germany’s colonial past. The video narrates Michael’s extraordinary experiences as a Black person in Germany. However, subsequent analysis by researchers such as E. P. Johnson, has drawn attention to the more troubling implications of Black identity politics. Black pride can inadvertently promote the problematic notion of Black authenticity – that is to say, it can construct an image of the the “real Blacks” and the “real” Black experience, to which the individuals must conform and relate. This line of thinking can hinder efforts geared towards separating identity from race. Race does not define us, but it does influence our experience of the world. Needless to say, “Black” includes a spectrum of peoples whose experience of race varies depending on the interaction of other factors, such as class, culture, gender, nationality, etc. For many people, race is not a black and white issue, but a multi-front struggle for inclusion in their “own” communities. Theodor Michaels Autobiografie ist so aberwitzig, dass sie erfunden sein könnte, wenn sie nicht allzu wahr wäre. Er entfaltet in ›Deutsch sein und schwarz dazu‹ eine Welt, die man so nicht gekannt hat, beschrieben von einem Mann, den man für seine Kraft, das alles zu bewältigen, nur bewundern kann, und dafür, dass es ihm gelungen ist, die Menschlichkeit zu bewahren. Theodor Michael erzählt ganz nüchtern, aber die Ereignisse sprechen für sich. Theodor Michael wurde 1925 in Berlin als Sohn einer Deutschen und eines Kameruners geboren wurde. Als sein Vater nach Deutschland kam, war Kamerun noch deutsches Schutzgebiet, sprich Kolonie. Afrikaner wurden in Deutschland ganz freundlich aufgenommen. Nach dem Ersten Weltkrieg waren die Kolonien verloren und das Klima wurde deutlich unfreundlicher. Man fand, die Schwarzen sollten den Deutschen keine Arbeitsplätze wegnehmen. Aber in den sehr beliebten Völkerschauen kamen sie noch unter, die “Artfremden” mit dem “negroiden Einschlag”. Sogar in der Nazi-Zeit, als Statisten in den äußerst beliebten Kolonialfilmen. Doch dann landeten sie im KZ oder in Zwangsarbeiterlagern. So erging es auch Theodor Michael: Nachdem seine Eltern starben, schlug er sich als Page, Portier und Komparse durch, bis er 1943, mit 18 Jahren, in einem Zwangsarbeiterlager interniert wurde. Theodor Michael hat das alles überstanden, um dann nach Kriegsende feststellen zu müssen, dass er der Kollaboration verdächtigt wurde, weil er überlebt hatte. Damals hätte er es sich nicht träumen lassen, dass er einmal als Regierungsdirektor beim BND in den Ruhestand gehen würde. Seit seiner Pensionierung engagiert er sich für die afro-deutsche Gemeinde und ist ein gefragter Ansprechpartner für die Presse. An exhibit gives voice to the histories of Africans, African-Americans and Afro-Germans from the past 300 years of German history. It presents a differentiated perspective on the lives and histories of blacks in Germany. Asked what comes to mind when they think about Germany, many foreigners conjure up stereotypical images of Oktoberfest, the Holocaust and the Berlin Wall. But these images of Teutonic culture and society do little to reflect the diversity of the contemporary, multiethnic Federal Republic of Germany where one fifth of the population has an ethnic minority background, according to an exhibition that opened Saturday (3.11.2012) at Cologne’s Alte Feuerwache. Jonas Behre, director at the Initiative for Black People in Germany (ISD), helped organize the exhibit titled “Homestory Deutschland: Black Biographies from History and the Present” and which provides a collective self-portrait, giving voice to the complex and varied histories of Africans, African-Americans and Afro-Germans from the past three centuries of German history. …Another of the biographies illuminated in the exhibition is that of Afro-German actor, journalist and activist Theodor Wonja Michael. 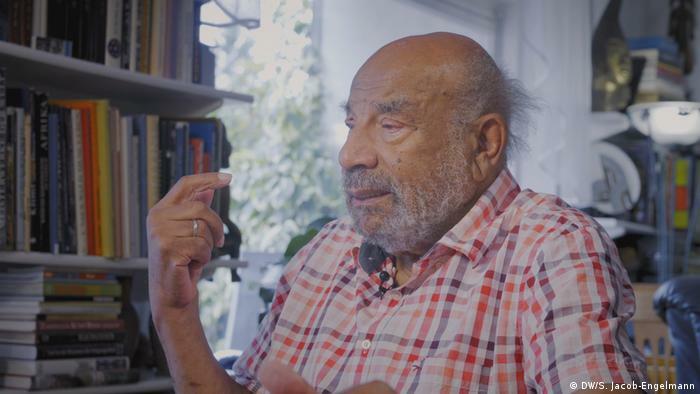 Born in Hamburg in 1925, Michael is Germany’s oldest living Afro-German. His father moved from Cameroon—then a German colony—to Germany in 1904. Denied access to higher education on the basis of skin color, he would have liked to have become an archeologist or an ethnologist. But as a young man, one of the few possibilities he had to earn a living wage was as an actor in colonial films or “Völkerschauen”—the ethnological expositions or “human zoos” popular in Germany in the 19th and early 20th centuries. After the end of the Second World War, Michael found it hard to get work he managed to get work as an actor of the theater stage. Michael remembers how his father always felt it was his natural right to live in Germany and how this attitude remains integral to own perspective on life as an Afro-German today.